The president tires to score political points in a state that he narrowly lost in 2016 but hopes to win in his re-election bid next year. 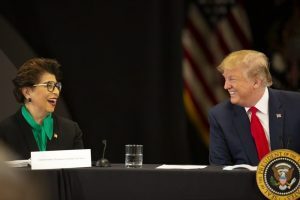 BURNSVILLE, Minn. — President Trump played up the benefits of his tax cuts on Monday’s tax filing day in a state where he’s aiming to turn a narrow defeat in the 2016 presidential race into a victory in his re-election bid next year. Most economists – including at the Federal Reserve – anticipate growth will slump this year to just above 2 percent as the stimulus from the tax cuts wanes. The White House insists growth will again top 3 percent this year, saying the benefits from a reduced corporate tax rate and other reductions will boost performance.